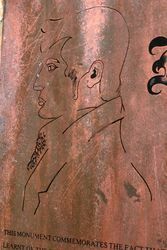 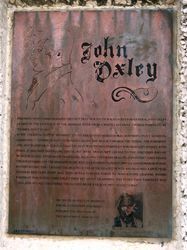 The monument commemorates the fact that John Oxley learnt of the existence of the Brisbane River from Thomas Pamphlett at Toorbul Point. This monument commemorates the fact that New South Wales Surveyor, General John Oxley, learnt of the existence of the Brisbane River from a white castaway Thomas Pamphlet, at Toorbul Point in 1823. 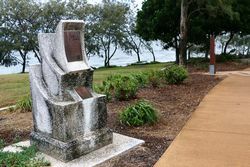 In the Colonial cutter `Mermaid` Oxley sailed into Moreton Bay, rounding Point Skirmish, observing a number of natives running along the beach towards the vessel, the foremost one much lighter in colour than the rest was Thomas Pamphlet who had left Sydney with three other men travelling south, but were driven off course to the northern end of Moreton Island. 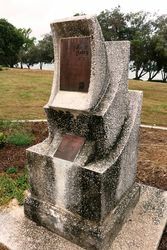 After much travelling, believing they were heading for Sydney, the found their way barred by the Brisbane River, which explorers Flinders, Bingle and Edwardson had sought in vain. 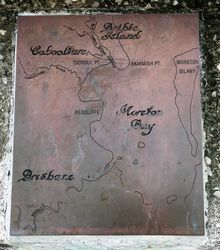 They crossed the mouth of the river, headed north and reached a spot near Flinders Red Cliff Point and then moved further north to Pumicestone Channel where Pamphlet was found. 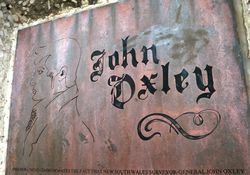 John Oxley then set about examining this story that Pamphlet had told and at last discovered the elusive river which he proceeded to map.